Tucked away in a forested park just outside of the City of Squamish, Alice Lake is a small piece of gem that offers peaceful, easy fishing opportunities for families and beginners. This is one of many lakes that is seasonally stocked with rainbow trout by the Fraser Valley Trout Hatchery, but it also has its own native population of trout and char. Mix the fishing up with camping nearby and you will have a great weekend getaway. Alice Lake is located in Alice Lake Provincial Park. When heading north on Highway 99, turn right onto Alice Lake Road just minutes after City of Squamish. Continue on Alice Lake Road and follow the signs to the parking lot turn-off. While a boat launch is not available, the parking lot is a short walk from the lake so carrying a small craft is not very labour intensive. Driving time from Vancouver is just over one hour. Alice Lake is typically stocked during April and May, so fishing is obviously best during these months. Summer fishing can be fair, but it is not as suitable for serious anglers as the lake can be overcrowded with campers. Fall fishing can be good once again after recreational usage lightens, but there are usually better fishing destinations during that time of the year. Because Alice Lake is not a large lake, shore fishing can be done quite easily if you are fishing with a spinning outfit. Deep water can be found very close to shore when fishing from rocks and logs. While the beach section is quite shallow, there are floating docks where fishing can be done, as long as they are not occupied by other recreational users. Please note the no fishing period on the floating dock, which is specified in the park. When spincasting, small spoons and spinners will often produce. A small rubber grub rigged onto a small hook, which is casted and retrieved with the aid of a few split shots can be just as deadly as a trolled fly. Effective bait used for stocked rainbow trout include dew worm, deli shrimp and single eggs. These can either be fished on the bottom or suspended with a small float. Because these stocked rainbow trout are less than 1lb, it is best to increase your hookups by using light tackle. A small craft, such as a row boat, pontoon boat or float tube is best used at Alice Lake if you choose to go offshore. A craft is advantageous if an angler chooses to flyfish. Slowly trolling a fly by drifting in a small craft is a relaxing way of fishing. 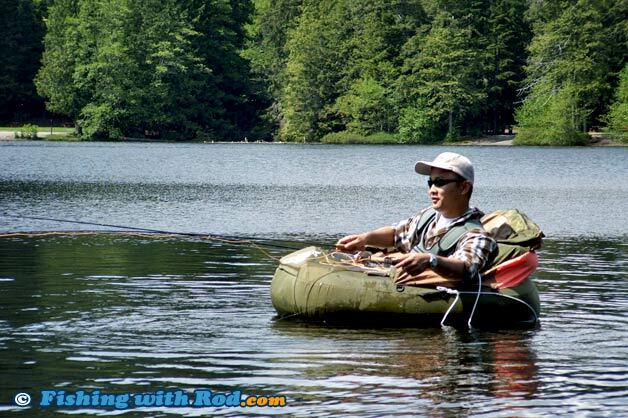 Be sure to hold onto the rod, as hits often happen suddenly and can take your rod away. If a school of fish is located, it is best to anchor and focus on one spot for consistent result. Alice Lake is located in Region 2 in the British Columbia freshwater fishing regulations. Alice Lake is located in a provincial park, which is used by campers, mountain bikers and other recreational groups. Please respect other users when using the area. Keeping the noise level down and picking up your own garbage makes everyone's experience enjoyable.